From left, Anna Floeter, Laura Ilko and Megan Cook get to work on fiber art at Yampa Valley Fiberworks north of Craig. The Yampa Valley Fiberworks Whorling Women will compete in a worldwide competition called Spinzilla next week. Get ready to be “spin-bombed,” Craig. The Yampa Valley FiberworksYampa Valley Fiberworks Whorling Women will participate in Spinzilla next month, hoping to out-spin their competition while raising funds and awareness for the yarn spinning and fiber community. Whorling Women will participate in Spinzilla next month, hoping to out-spin their competition while raising funds and awareness for the yarn spinning and fiber community. Yampa Valley Fiberworks Whorling Women will participate in Spinzilla next month, hoping to out-spin their competition while raising funds and awareness for the yarn spinning and fiber community. Spinzilla is a worldwide challenge, sponsored by The National NeedleArts Association and the Spinning and Weaving Group, to see which team can spin the most yarn in one week. “The art of spinning is putting twist to fiber and can be done using several different methods, like the drop spindle and the spinning wheel,” said Lorrae Moon, who owns Yampa Valley Fiberworks with her husband, Lewis Moon. 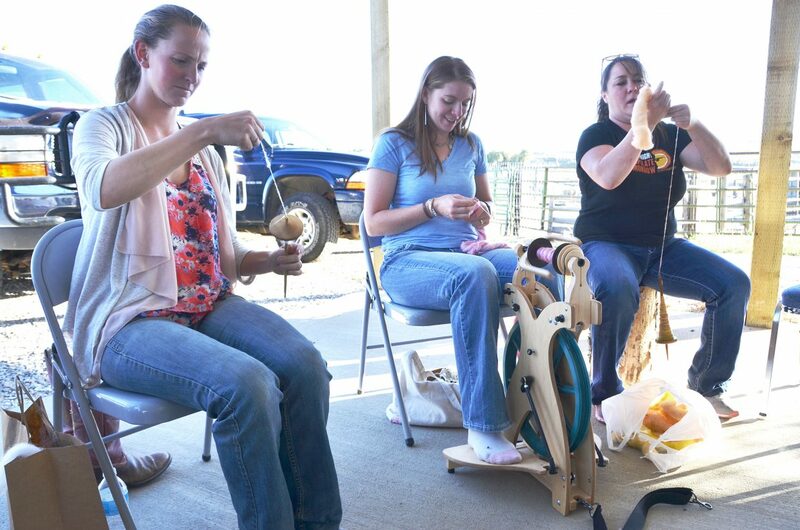 Spinzilla will take place the week of Oct. 3 to 9, where a Whorling Women team of up to 25 spinners will show up at several public locations in Craig to spin as many yards as they can, using different types of local fiber. One of the locations will be Museum of Northwest Colorado from 10 a.m. to 4 p.m. on Oct. 8. The other times and locations aren’t being disclosed because the group wants to make them a surprise to the community, Lorrae Moon said. It’s the first year Yampa Valley Fiberworks will participate in the competition and they are the only competing team on the Western Slope out of five teams in Colorado and 77 teams total. “In three years, Spinzilla teams have collectively spun 10.4 million yards of yarn, and the Yampa Valley Fiberworks Whorling Women are looking forward to adding to this impressive yardage, along with bragging rights as the 2016 Spinzilla champion,” Lorrae Moon said. The Whorling Women group was formed in January when local fiber instructor Susan Domer teamed up with the Moons and taught a drop spindle class at Yampa Valley Fiberworks, the news release states. The class was so popular that a second was soon scheduled. The classes now include spinners from all over Moffat and Routt counties, and they meet regularly at 5 p.m. Thursdays on the front patio of Yampa Valley Fiberworks. “There used to be guns in the back of the trucks that pulled in here and now there are spinning wheels,” Domer said, highlighting the flavor of Northwest Colorado residents. Currently, the class also serves as practice for Spinzilla. Practice includes finding out how long it takes the spinners to fill a bobbin with spun yarn so that they know how much fiber they’ll need for the competition, Domer and Lorrae Moon said. “It’s just such a good community to be a part of because we’re one of the highest fiber-producing areas in the United States. It’s important to keep those kinds of things alive and if we can get a conversation going about fiber, you never know where it can go,” said Lorrae Moon in regard to why raising awareness about the spinning and fiber community is important. Laura Ilko is a young woman from Craig who plans to participate in Spinzilla. “It’s cool that younger generations are joining in because stereotypically, this is a hobby for older generations. It’s nice to see this form of art being carried on,” she said. For more information about Spinzilla, contact Lorrae Moon at 970-824-9568 or yampavalleyfiberworks@gmail.com.